It has been requested that the title of this article be changed to List of spacecraft on the Moon. Please see the relevant discussion on the discussion page. The page should not be moved unless the discussion is closed; summarizing the consensus achieved in support of the move. Locations of major spacecraft on the Moon superimposed on data from the Clementine mission in equirectangular projection. The remains of five S-IVB third stages of Saturn V rockets from the Apollo program are the heaviest single pieces sent to the lunar surface. Humans have left over 187,400 kilograms (413,100 lb) of material on the Moon, and 380 kilograms (838 lb) of Moon rock was brought back to Earth by Apollo and Luna missions. 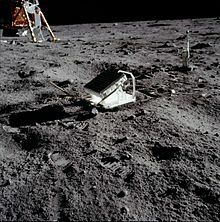 The only artificial objects on the Moon that are still in use are the retroreflectors for the lunar laser ranging experiments left there by the Apollo 11, 14, and 15 astronauts and by the Lunokhod 1 and Lunokhod 2 missions. Objects at greater than 90 degrees east or west are on the far side of the Moon, including Ranger 4, Lunar Orbiter 1, Lunar Orbiter 2 and Lunar Orbiter 3. US 1973 328 Crashed ? Soviet Union 1974 4000 Crashed ? Chang'e 3 and Yutu China 2013 1200 Rover ceased transmission March 2015. ^ "NASA NSSDC Master Catalog – Luna 2". Retrieved 2010-12-24. ^ "NASA NSSDC Master Catalog – Luna 2". Retrieved 2015-07-16. ^ "NASA NSSDC Master Catalog – Ranger 4". Retrieved 2010-12-23. ^ "NASA NSSDC Master Catalog – Ranger 6". Retrieved 2010-12-24. ^ "NASA NSSDC Master Catalog – Ranger 7". Retrieved 2010-12-24. ^ "NASA NSSDC Master Catalog – Luna 5". Retrieved 2010-12-24. ^ "NASA NSSDC Master Catalog – Luna 7". Retrieved 2010-12-24. ^ "NASA NSSDC Master Catalog – Luna 8". Retrieved 2010-12-24. ^ "NASA NSSDC Master Catalog - Ranger 8". Retrieved 2010-12-24. ^ "NASA NSSDC Master Catalog - Ranger 9". Retrieved 2010-12-24. ^ "NASA NSSDC Master Catalog - Luna 9". Retrieved 2010-12-24. ^ a b c d e f g h i j k l Spacecraft was in lunar orbit but is assumed to have decayed from orbit and crashed into the Moon, location unknown. ^ "NASA NSSDC Master Catalog - Luna 10". Retrieved 2010-12-24. ^ "NASA NSSDC Master Catalog - Luna 11". Retrieved 2010-12-24. ^ "NASA NSSDC Master Catalog - Luna 12". Retrieved 2010-12-24. ^ "NASA NSSDC Master Catalog - Surveyor 1". Retrieved 2010-12-24. ^ "NASA NSSDC Master Catalog - Luna 13". Retrieved 2010-12-24. ^ "NASA NSSDC Master Catalog - Lunar Orbiter 1". Retrieved 2010-12-24. ^ "NASA NSSDC Master Catalog - Surveyor 2". Retrieved 2010-12-24. ^ "NASA NSSDC Master Catalog - Lunar Orbiter 2". Retrieved 2010-12-24. ^ "NASA NSSDC Master Catalog - Lunar Orbiter 3". Retrieved 2010-12-24. ^ Apollo 12 returned about 10 kg of the Surveyor 3's original landing mass of 302 kg to Earth to study the effects of long term exposure. ^ "NASA NSSDC Master Catalog - Surveyor 3". Retrieved 2010-12-24. ^ "NASA NSSDC Master Catalog - Lunar Orbiter 4". Retrieved 2010-12-24. ^ "NASA NSSDC Master Catalog - Surveyor 4". Retrieved 2010-12-24. ^ "NASA NSSDC Master Catalog - Explorer 35 (IMP-E)". Retrieved 2010-12-24. ^ "NASA NSSDC Master Catalog - Lunar Orbiter 5". Retrieved 2010-12-24. ^ "NASA NSSDC Master Catalog - Surveyor 5". Retrieved 2010-12-24. ^ "NASA NSSDC Master Catalog - Surveyor 6". Retrieved 2010-12-24. ^ "NASA NSSDC Master Catalog - Surveyor 7". Retrieved 2010-12-24. ^ "NASA NSSDC Master Catalog - Luna 14". Retrieved 2010-12-24. ^ "NASA NSSDC Master Catalog - Apollo 10 LM(Snoopy) descent stage". Retrieved 2010-12-24. ^ "NASA NSSDC Master Catalog - Luna 15". Retrieved 2010-12-25. ^ "NASA NSSDC Master Catalog - Apollo 11 LM descent stage". Retrieved 2010-12-25. ^ a b c d e f The ascent stage of Apollo 10 was commanded to fire its engine, left lunar orbit and entered solar orbit. The ascent stage of Apollo 11 was left in orbit and thereafter its orbit decayed and it crashed onto the Moon at an unknown location. The Apollo 16 ascent stage failed to crash onto moon when commanded and it decayed from orbit at a later date and also crashed at an unknown location. The ascent stages of the remaining successful missions (Apollo 12, 14, 15, and 17) were each deliberately crashed onto the Moon. Apollo 13's complete Apollo Lunar Module re-entered Earth's atmosphere after having served as a lifeboat during the aborted mission. ^ "NASA NSSDC Master Catalog - Apollo 11 LM ascent stage". Retrieved 2010-12-25. ^ "NASA NSSDC Master Catalog - Apollo 12 LM descent stage". Retrieved 2010-12-25. ^ "NASA NSSDC Master Catalog - Apollo 12 LM ascent stage". Retrieved 2010-12-25. ^ a b c Luna program sample return mission; mass listed is for both ascent and descent stages, though only the descent stage was left on the Moon. ^ "NASA NSSDC Master Catalog - Luna 16 descent stage". Retrieved 2010-12-25. ^ Astronautix.com, Apollo 13 Archived 2004-01-04 at the Wayback Machine: The S-IVB/IU impacted the lunar surface at 8:10 p.m. EST on April 14 at a speed of 259 meters per second (incorrect, should probably be 2590 meters/sec), […] 137.1 kilometers from the Apollo 12 seismometer. ^ "NASA NSSDC Master Catalog - Apollo 13 S-IVB". Retrieved 2010-12-25. ^ "NASA NSSDC Master Catalog - Luna 18". Retrieved 2010-12-25. ^ "NASA NSSDC Master Catalog - Luna 19". Retrieved 2010-12-25. ^ "NASA NSSDC Master Catalog - Apollo 14 SIVB". Retrieved 2011-01-01. ^ "NASA NSSDC Master Catalog - Apollo 14 LM descent stage". Retrieved 2011-01-01. ^ "NASA NSSDC Master Catalog - Apollo 14 LM ascent stage". Retrieved 2011-01-01. ^ "NASA NSSDC Master Catalog - Apollo 15 SIVB". Retrieved 2011-01-01. ^ "NASA NSSDC Master Catalog - Apollo 15 LM descent stage". Retrieved 2011-01-01. ^ "NASA NSSDC Master Catalog - Apollo 15 LM ascent stage". Retrieved 2011-01-01. ^ "NASA NSSDC Master Catalog - Apollo 15 subsatellite". Retrieved 2011-01-01. ^ "NASA NSSDC Master Catalog - Luna 20". Retrieved 2011-01-01. ^ "NASA NSSDC Master Catalog - Apollo 16 S-IVB". Retrieved 2011-01-01. ^ "NASA NSSDC Master Catalog - Apollo 16 descent stage". Retrieved 2011-01-01. ^ "NASA NSSDC Master Catalog - Apollo 16 ascent stage". Retrieved 2011-01-01. ^ "NASA NSSDC Master Catalog - Apollo 16 Subsatellite". Retrieved 2011-01-01. ^ "NASA NSSDC Master Catalog - Apollo 17 S-IVB". Retrieved 2011-01-01. ^ "NASA NSSDC Master Catalog - Apollo 17 descent stage". Retrieved 2011-01-01. ^ "NASA NSSDC Master Catalog - Apollo 17 ascent stage". Retrieved 2011-01-01. ^ "Why Nasa wants to bring back 96 bags of poop from Moon". The Times of India. 2019-04-09. Retrieved 2019-04-11. ^ Lander and rover weighed 1814 kg; the rest assumed to have decayed in orbit and impacted the Moon. ^ "NASA NSSDC Master Catalog - Explorer 49/RAE-B". Retrieved 2011-01-01. ^ "NASA NSSDC Master Catalog - Luna 22". Retrieved 2011-01-01. ^ "NASA NSSDC Master Catalog - Luna 23". Retrieved 2011-01-01. ^ "NASA NSSDC Master Catalog - Luna 24". Retrieved 2011-01-01. ^ Was injected into lunar orbit in 1990, assumed to have decayed from orbit. ^ "NASA NSSDC Master Catalog - Hagoromo/Hiten Orbiter". Retrieved 2011-01-01. ^ "NASA NSSDC Master Catalog - Hiten". Retrieved 2011-01-01. ^ "NASA NSSDC Master Catalog - Lunar Prospector". Retrieved 2011-01-01. ^ "University of Texas Engineering News - Lunar Prospector Impact Location Estimate". Archived from the original on 2010-12-29. Retrieved 2011-01-01. ^ Klesman, Alison (22 Sep 2017). "New observations reveal a lunar orbiter's final resting place". Astronomy Magazine. Retrieved 27 Sep 2017. ^ "NASA NSSDC Master Catalog - Moon Impact Probe / Chandrayaan 1". Retrieved 2011-01-01. ^ "Frontline India's National Magazine - Moon Mystery - Moon Impact Probe impact coordinates". Retrieved 2011-01-01. ^ "JAXA Press Release (PDF)" (PDF) (in Japanese). JAXA. 2009-02-18. Retrieved 2009-02-20. ^ "NASA NSSDC Master Catalog - Okina (Rstar) - Kaguya". Retrieved 2011-01-01. ^ "JAXA 18 February 2009 SELENE status - Okina (Rstar) impact estimate position - (page 3 in Japanese translated with Babelfish)" (PDF). Retrieved 2011-01-01. ^ "NASA NSSDC Master Catalog - Chang'e 1". Retrieved 2011-01-01. 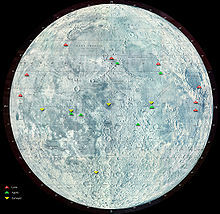 ^ "China People's Daily Online, 2 March 2009 - Chang'e-1 impacts moon (coordinates)". Retrieved 2011-01-01. ^ "JAXA HOT TOPICS". JAXA. 2009-06-11. Archived from the original on 2009-06-07. Retrieved 2009-06-11. ^ "NASA NSSDC Master Catalog - KAGUYA (SELENE)". Retrieved 2011-01-01. ^ "JAXA Selenological & Engineering Explorer - KAGUYA (SELENE) impact coordinates". Retrieved 2011-01-01. ^ "Guide to Seeing the LCROSS Lunar Impact". Retrieved 2009-10-27. ^ "NASA NSSDC Master Catalog - LCROSS Shepherding Spacecraft". Retrieved 2011-01-01. ^ "NASA NSSDC Master Catalog - LCROSS Centaur". Retrieved 2011-01-01. ^ "NASA Probes Prepare for Mission-Ending Moon Impact". Retrieved 2012-12-13. ^ Wall, Mike (March 12, 2015). "The Moon's History Is Surprisingly Complex, Chinese Rover Finds". Space.com. Retrieved 13 March 2015.